Next up on the emotional intelligence list is—wait for it…drama in the classroom…the kind that won’t make you nuts! This subject is near and dear to my heart because I have been a community theatre enthusiast most of my life! I suppose I just gravitated toward drama because I liked the fantasy, the story, the chance to be someone else. Unknowingly, drama was actually helping me become more in tune with other people—on and off the stage. That’s the crux of helping students in the classroom with dramatic presentations. They allow kids the chance to grapple with their own emotions and personalities as they learn how to interpret a character in a play. Kids forge self-awareness skills each time they attempt to interpret a character in a story. These skills spill over into real life relationships. Self-Management. If there is one quality a teacher wants in students, it’s self-management. Kids who can manage their own practice, their own behavior, and their own reactions to situations have a better chance at success in life. What better platform to practice these behaviors than a play! Self-Direction. When kids engage in drama, they learn how to explore different parts of their personalities…sometimes parts that are very confusing—maybe even a bit scary. But, the setting for a play serves as a safe-zone by giving them the freedom to try various approaches to interpret their character. Kids who learn how to balance their own emotional needs and wants develop self-direction, in other words, they get motivated. Self-direction is slightly more complex than self-management. Self-directing kids learn not only how to adjust their expectations of themselves, but also that of others. Because drama pushes students to explore their own motivations and the motivations of others, they learn how to direct their own emotional messages and how to perceive the emotional messages of others. What a life benefit! Fun. 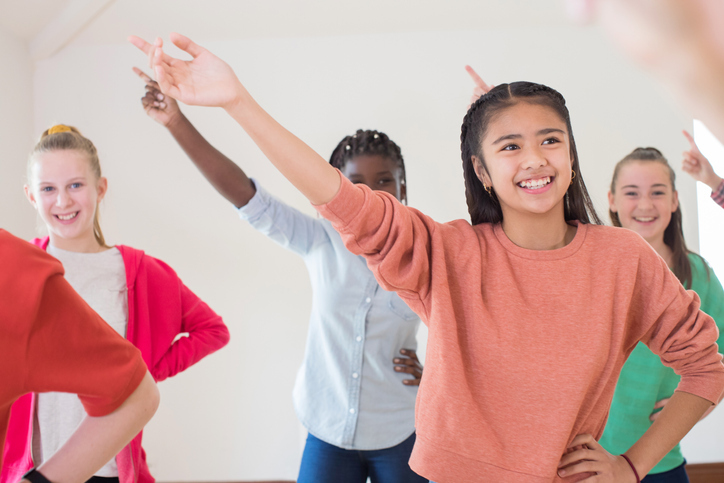 While drama does help kids with connecting their emotions with learning, let’s not forget that for many kids, drama is just plain fun! Just as in great novels and stories that kids read, a dramatic or comedic play can have a powerful impact on a kid’s outlook on life. Being involved with others, acting out roles, pretending to be something or someone else is often just what kids need to elevate their self-esteem and grow their confidence. Give it a Try! To get the drama started in your classroom, search the internet for “plays for kids in the classroom.” You will find more than enough resources to get you going. Also, check out your anthologies and literature sets. Sometimes it is better for you and your students to write your own plays based on stories you all love. However you implement it, take it slow…start small. Then, as you all grow in your ability to interpret the various stories, branch out. I have no doubt you will be pleased with the results you see in your students.